I’ve just finished reading The Silence by Tim Lebbon, a book I thoroughly recommend if you’re a horror fan. It’s set in a near-future (very near future – November 2016) Britain, which has been invaded by hordes of voracious flesh-eating bats. The title comes from the fact that the bats evolved in an isolated cave system to be pale and eyeless (having played far too much Pokémon Go over the last couple of weeks, I couldn’t help but visualise them as albino Zubats) and find food by sound. The only way to escape them is to be silent. As the book progresses, the bats spread across the country, eating people as they go, and civilisation progressively crumbles. In some ways this is a familiar tale, not that dissimilar in structure to the many zombie apocalypse narratives out there, but Lebbon manages to find a fresh and disturbing take on it. His protagonist is a deaf girl whose ability to communicate silently with her family through sign language is at first an advantage – and then becomes dangerous when other survivors discover her and want to use her skills. I found the book a gripping read. But, although I’m quite a fan of apocalyptic fiction, I find that recent events have made it seem less escapist than it once did. Perhaps, as real life becomes progressively more like a cross between Dr Strangelove and The Hunger Games, it will fall out of fashion. Some people may wonder what the appeal of the apocalypse is anyway. If you’re going to read fantasy, wouldn’t you rather have something more pleasant? Well, here’s the thing. Modern life is very complex and can sometimes confusing, and most of us work in jobs where there’s little obvious impact to what we do. In the world of The Silence, however, life is simple, and the impact of your decisions is clear. If you make the wrong decision, you and your family get devoured by evil bats. If you make the right decision, you don’t. Wouldn’t it be nice to have that kind of clarity in your everyday life? Conspiracy thrillers – and their real-life-to-a-certain-value-of-real counterpart, conspiracy theories – have a different, but broadly related appeal. While on the surface the idea that the world is being controlled from behind the scenes by a sinister cabal of lizard people might sound terrifying, it’s actually kind of comforting to imagine that somebody, somewhere, knows what they’re doing. That there actually is somebody in charge after all, guiding the horrifying, chaotic mess we call reality to their own ends, whatever those ends may be. The purpose of fiction is, if nothing else, to help us escape from reality for a while. And I seem to have come to the conclusion that being eaten by Pokémon-gone-wrong or controlled by lizard people sounds more appealing than real life right now. 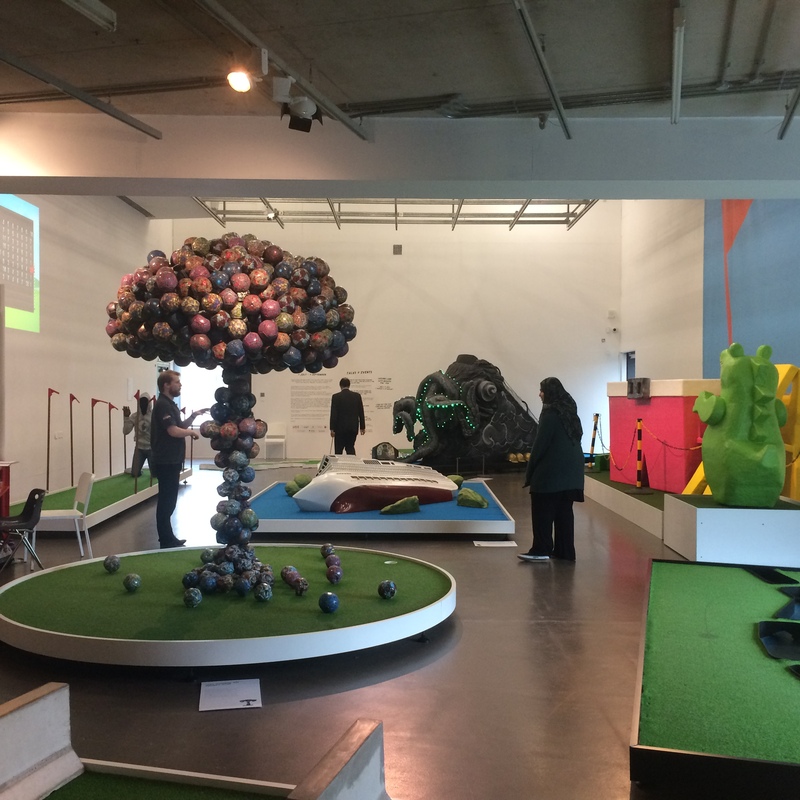 Today, caught out in the rain at the Quad cinema in Derby, I played a round of crazy golf with a difference. It was indoors for starters – inside the art gallery space at the back of the cinema. And each hole was designed as an interactive work of art, enabling you to putt your ball around the Seven Bridges of Konigsberg, into the mouth of a kneeling man (who then pooped it out again) or through a maze of walls and barbed wire representing an armed border crossing. It was a diverting enough way to spend half an hour on a rainy afternoon, but the intention wasn’t just to be fun, but to make you think about the issues each hole presented – about police brutality, the environmental impact of cruise ships, and so forth. The problem I found was that the accompanying labels for each hole were just a little bit too didactic, a little bit too telling me what to think rather than just telling me to think. Do football games between African and European teams represent the nexus of colonial exploitation and post-colonial struggle? Well, maybe, but while I’m nudging my golf ball around a mushroom-cloud shaped heap of miniature footballs covered in batik fabric, perhaps I’d prefer to make up my own mind about the symbolism. I’ve argued before on this blog that all constructed narratives, even supposedly escapist fantasy novels, are inherently political. Visual art arguably has the prerogative to be apolitical if it wants to, to be pretty pictures and nothing more, and yet I’ve frequently found that, as today, art galleries are keen to spoon-feed us the Political Messages behind their displays, usually some variant on post-Marxism. Now I’m an incorrigible old leftie but I find these messages irritating, and I doubt anyone with differing views is going to be persuaded. Books with a similar lack of subtlety – the one I’ve read most recently being Robert Heinlein’s Starship Troopers, a piece of right-wing militaristic propaganda thinly disguised as science fiction – leave me similarly unimpressed. Well, maybe they will get hold of the wrong end of the proverbial. But that’s the risk you take when you put your art into the world. Death of the author and all that – just because you’re the creator, you don’t get to decide what your work means. And, if my reaction today is in any way typical, if you try to tell people what to think about it, they’ll just get annoyed. Still, the crazy golf was fun.